130 year old Paper Carving Heritage: Hidden Artisans from Patan, Gujarat - Be On The Road | Live your Travel Dream! Are you a culture aficionado? Are you one of those who is always on the look out for hidden cultural trails? Well, if you do, you will enjoy this artisan that I discovered in North West Gujarat in the erstwhile capital town of Gujarat. This artisan and his family have been practicing the art of super intricate paper carving for the past 130 years. But, paper carving wasn’t in their blood always. Rather, they were into wrestling. Sounds fascinating, right? 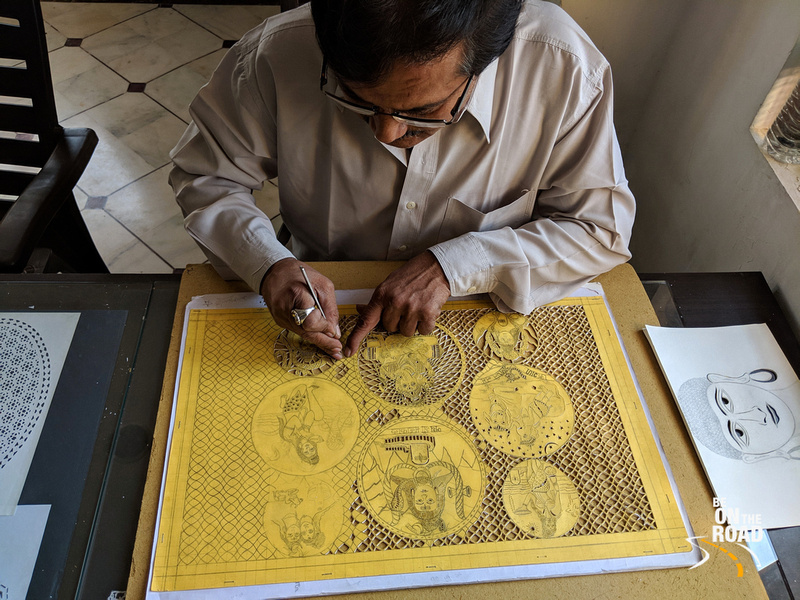 I met Mr. Narendra Jadiya, the paper carving artist, when I was at the Patan Patola museum trying to know more about the rich heritage of the Patola saris. Apparently, he used to practice at his home till a few years back, but once the Patola museum was built, the Salvi family (who are the traditional weavers of the Patola Sari) were kind enough to offer him a space to showcase his craft too. And that is how I managed to bump into the iconic paper carvers from the Jadiya family. When I asked Mr. Narendra Jadiya how it all started, he told me that his ancestors were all into wrestling and they were far away from the creative arts, but all that changed during the time of his great grandfather who took to paper carving as a hobby. There was no specific effort to make money from it, but his great grandfather was so in love with the art that he kept practising it till he was alive and passed on this art form to his children and from there to his grand and great grandchildren. Today, Mr. Narendra Jadiya continues to practice this art form started by his great grand father in his family and hopes that his son will also follow in his footsteps. 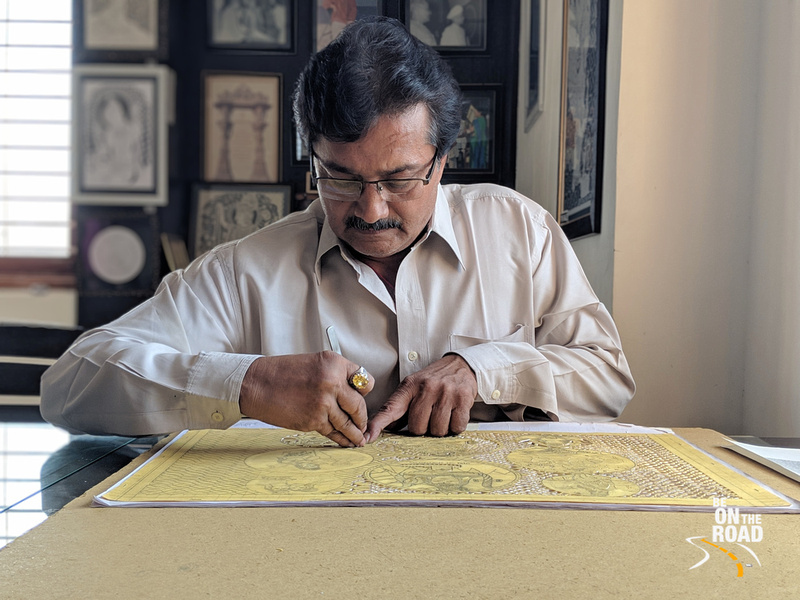 Through his paper carving art, he depicts mythological stories of the various gods like Ram, Shiva, Buddha or Ganesha and many other diverse topics such as architecture, nature, birds and animals, etc.. But, the gods remain his primary interest. He either makes simple carvings or something that is extremely detailed and that is very work intensive. First, he sketches the image that he wishes to carve onto a thick card board paper. Then he keeps it over good quality white paper and then using a semi-sharp knife like instrument, he starts carving the image on the white paper. A thick board is kept at the bottom for support and the work is either done next to a sun lit window or under a powerful table lamp so that attention to detail isn’t lost. Simple paper carving art takes a few hours and complex ones can take a few weeks or so. Do pay him a visit the next time you are in Patan for a culture and heritage holiday. You should definitely spend time with him and watch him go about his craft. His work looks simple to the untrained eye, but it involves a lot of patience and skill. You will only realize that when you see his best work products, which he usually keeps hidden in his drawers. They will certainly blow your mind. Do remember to coax him to show a few to you! And may be, if you like anything in particular, you could even buy it from him. In case you can’t find him at the Patan Patola Museum, you can either email him at papercarving1890@gmail.com, call him at 08866567702 / 9033719148 or meet him at his residence on Ramprasad road next to Girdhari temple in Patan. I hope you enjoy his unique paper carving art as much as I did! The nearest airport is Ahmedabad. Mahesana is the nearest long distance railway station, though Ahmedabad would be your best bet for all air, road and rail connectivity from all over India. Patan is about a 2 hour drive from Ahmedabad. You could either stay in a guest house or hotel in Patan, in a home stay in any of the surrounding villages or in a luxury hotel in Ahmedabad. Dreams do come true at Disneyland!